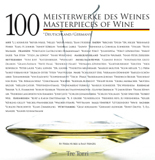 The authors, Pekka Nuikki editor of FINE magazine, and Ralf Frenzel one of Germany’s first and youngest sommeliers have set themselves about the difficult task of discovering the 100 Masterpiece wines of Germany. The title is perhaps a bit misleading as the book actually looks at wineries as opposed to individual wines or vintage. Written in both English and German each winery is carefully detailed from its vineyard history and location to specific vinification methods that make it stand out. What is perhaps the best thing about this wine book, however, are the beautiful pictures taken by one of the authors. Rather than focus on photographs of domains or vineyards, the authors focus on the wine bottles themselves. One bottle from each winery is photographed twice with at least one being a close up of the label. Surely this book could also have been titled 100 Masterpieces of Wine Labeling as the artistic beauty of each wine’s label is on center stage whether modernist or traditional. Although this wine book could be used as a buying guide; it seemed to us more of a coffee table book given the artistry in the photography and the focus on the wineries rather than specific bottles of wine. Overall a beautifully crafted wine book, but a bit short on content. Great for wine label lovers and general conversation.